Fixed annuities are a great way to supplement lost income during retirement. 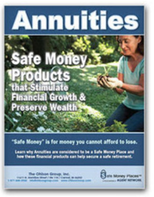 Fixed annuities provide guaranteed lifetime income you cannot outlive. Most annuities offer fixed interest rates. Here’s a fact that may surprise (and possibly scare) you: Social Security may replace up to 57% of lower income workers’ income; however, it may replace only 27% for higher income workers.